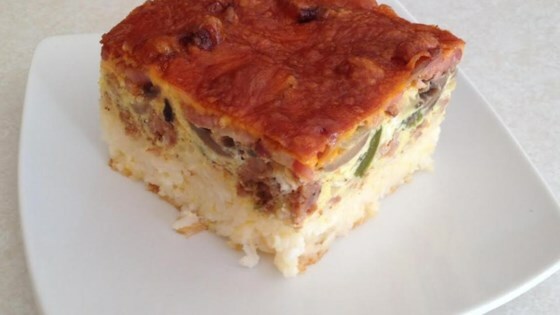 "I was looking for a rice-based breakfast bake, because we did not have any bread on hand. I could not find one anywhere on the internet, so I made one up and thought I would share it with everyone. I was pleasantly surprised with the outcome and have made it a few times now." Stir Colby-Jack cheese into the cooked rice; spread mixture over the bottom of a 9x13 glass baking dish. Combine sausage, bacon, mushrooms, green bell pepper, and onion in a bowl. Pour over rice in the baking dish. Beat eggs, milk, black pepper, and garlic powder together in a medium bowl. Pour evenly over the rice casserole. Top with Cheddar cheese. Bake in the preheated oven until firm in the center, about 45 minutes. Remove from oven and let sit, 5 to 10 minutes.